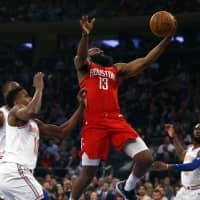 NEW YORK - Houston superstar James Harden continued his historic streak Wednesday night by scoring a career-high and franchise-record 61 points, but it was Eric Gordon who drained the biggest shot, a 3-pointer with nine seconds left, that gave the Rockets the lead for good in a wild 114-110 win over the New York Knicks. Harden has scored at least 30 points in 21 consecutive games, the fourth-longest such streak in NBA history (behind only three authored by Wilt Chamberlain). Chamberlain scored 30 points in 25 straight games during the 1960-61 season, in 31 straight games spanning the 1961-62 and 1962-63 seasons and in 65 straight games during the 1961-62 season. The 61 points are the most by a player in an NBA game this season — Kemba Walker scored 60 points for the Charlotte Hornets on Nov. 17 — and tied for the most scored by a Knicks opponent at the fourth and current Madison Square Garden, which opened in 1968. Kobe Bryant had 61 points for the Los Angeles Lakers on Feb. 2, 2009. “Every time I come to the Garden I got to put on a show. They expect it and that is what I gave them,” said Harden. 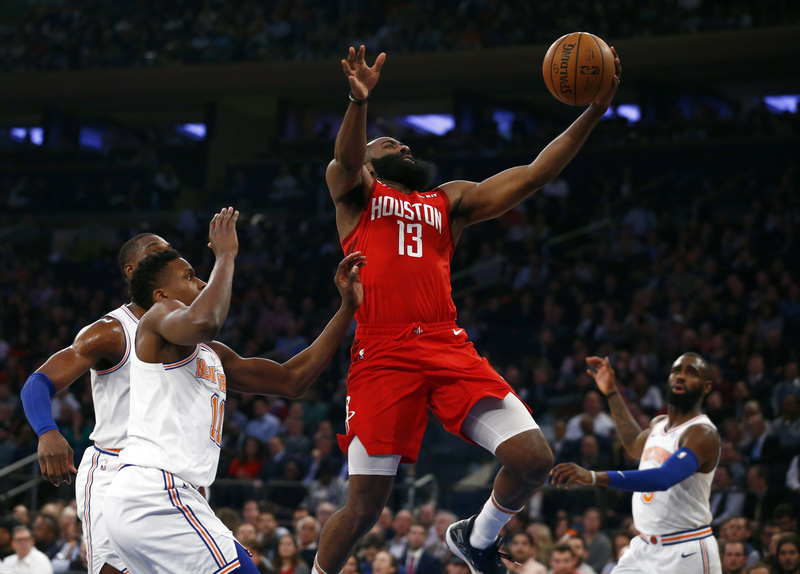 Harden also tied Bryant for the most points ever by an opponent at the fabled Garden and he is second all-time to former Knick Carmelo Anthony’s 62 points in 2014. In Indianapolis, Thaddeus Young scored 12 of his 23 points in the fourth quarter and finished with 15 rebounds as the Pacers held off a late rally to defeat Toronto in a game that may prove very costly in the long run. Indiana lost guard Victor Oladipo with 4:05 left in the first half. He left on a stretcher with what the team termed a serious right knee injury, and he is headed for an MRI exam Thursday. Oladipo, Indiana’s leading scorer on the season, had four points, three rebounds and one assist. Darren Collison added 17 points, and Bojan Bogdanovic had 16 points for the Pacers, who won their third game in a row. In Philadelphia, Joel Embiid scored 33 points and grabbed 19 rebounds to lift the hosts past San Antonio. DeMar DeRozan led the Spurs with 26 points while Patty Mills and Rudy Gay added 17 apiece.